1-CD-Album DigiPac (4-plated) with 36-page booklet, 20 tracks. Playing time approx. 54 minutes. 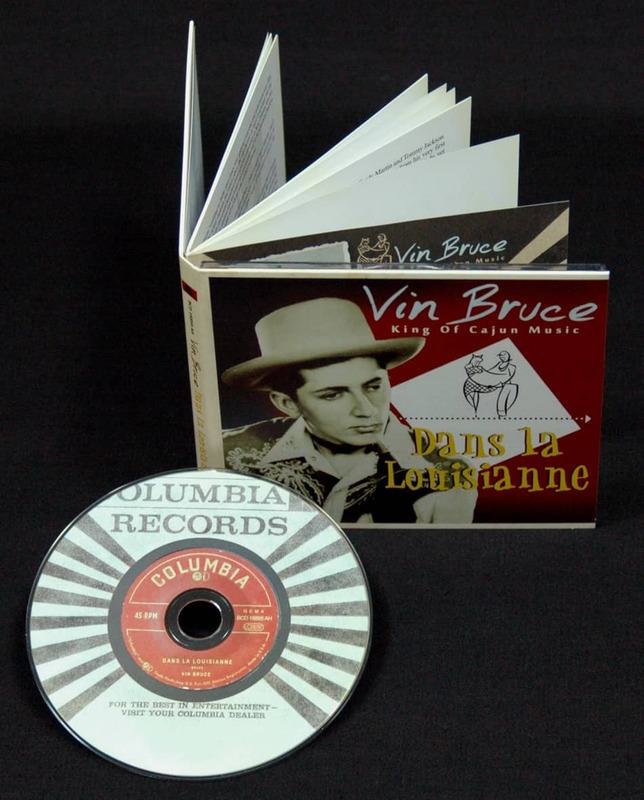 Long overdue set of Cajun icon Vin Bruce's very first recordings for Columbia Records spotlights a fascinating time and place in the development, popularity and rise of Cajun music and its inevitable collision with country and western at its mid-century apex. Hank Williams was so endeared to Vin Bruce's music that he invited him to play his public wedding ceremony at New Orleans' Municipal Auditorium. 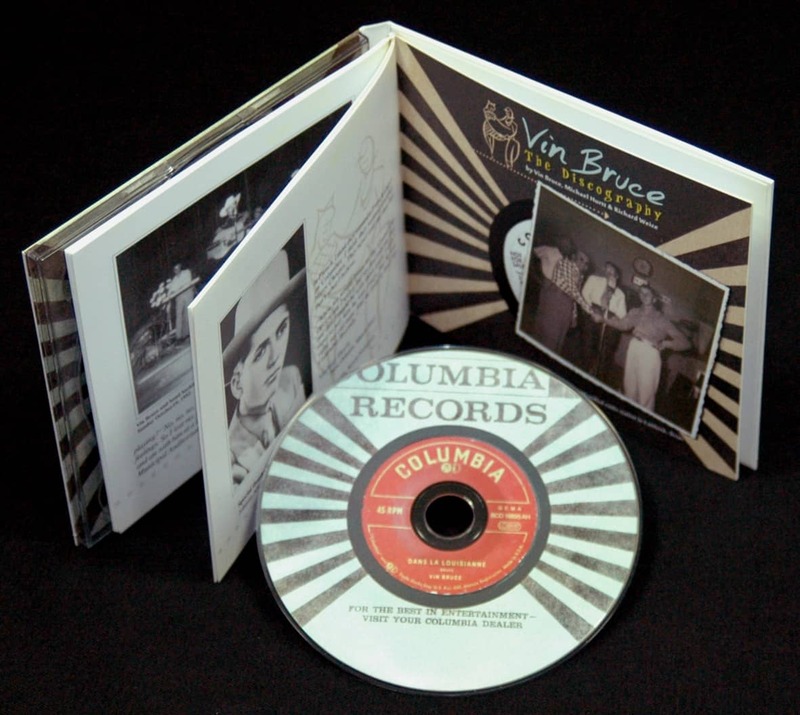 Produced by Don Law, Vin Bruce's Columbia sides represent the first time a Cajun artist was accompanied by Nashville's legendary session players. Among the highlights are Grady Martin multi-tasking on guitar, mandolin and fiddle, Owen Bradley on piano, Chet Atkins and Jack Shook and Tommy Jackson on guitars, and other leading lights of the early Nashville era. For the first time ever, these groundbreaking sides are brought together with flawless sound quality, including four never-before-released tracks. Highlights include the hit Dans la Louisianne, the plaintive hillbilly blues My Mama Said, songs from the pens of Bruce, Atkins, Felice and Boudleaux Bryant and Autry Inman, and the unreleased Cajun bopper 'Le d Atkins' stellar proto-rockabilly guitar picking. Jole Blon before it, that didn't keep it from becoming a country music sensation. 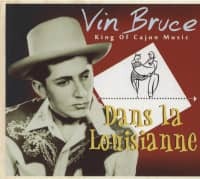 Hailing from Bayou Lafourche, below New Orleans, Vin Bruce and his peers Leroy Martin, Gene Rodrigue and Dudley Bernard developed their own stripe of Cajun music; an accordion-less string band style that was as much hillbilly as it was French. 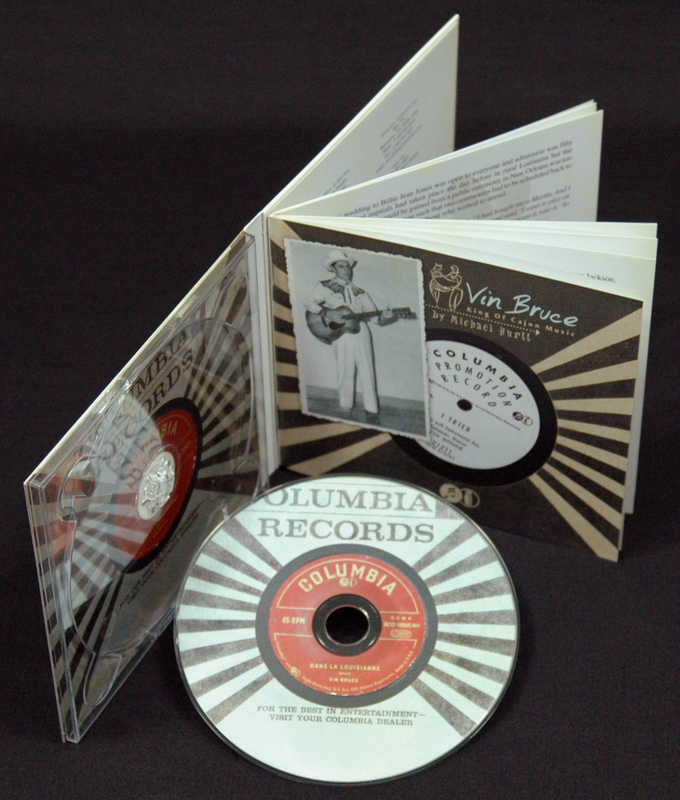 Vin Bruce's Columbia sides brought that sound to the jukeboxes, airwaves and the Grand Ole Opry. Hank Williams was so endeared to Vin Bruce's music that he invited him to play his public wedding ceremony at New Orleans' Municipal Auditorium. The authoritative booklet by Louisiana musicologist Michael Hurtt is the most detailed history of Vin Bruce and the Bayou Lafourche sound yet to be published, bringing together years of research, illuminating interviews and never-before-seen photographs. This set is a revelation for Cajun and country music fans alike. Lafourche Parish occupies a unique place in the colorfulpantheon of Louisiana music. A bayou community south of both New Orleans and Lafayette, its equidistance from these two distinctly different musical meccas seems to have had almost no overarching musical influence whatsoever. The string of tiny towns that begin to dot Bayou Lafourche where it intersects with old Highway 90, then wind along the tranquil waterway all the way to Grande Isle -- the final frontier before the Southland gives way to the Gulf Of Mexico -- have their own unique musical identity, rife with stylistic subtleties as intertwined as the musicians who created them. As compelling a musical stylist as the region that he hails from, Vin Bruce has justifiably been called the King of Cajun Music. While Texas fiddler Harry Choates had certainly paved the way with his 1947 hit Jole Blon -- and its many future offshoots and incarnations had begun to make Cajun somewhat of a household word in the world of country music -- Vin's five year tenure with Columbia Records, beginning in the early 1950s, representedthe first time that a Cajun artist was marketed to the widespread record-buying public by a major recording company. Additionally, Bruce was the first to record Cajun music with Nashville session players such as Chet Atkins, Grady Martin and Tommy Jackson. The straightforward, undiluted nature of his approach was evident from his very first single, Dans la Louisianne backed with Fille de la Ville (Girl Of The Town). In yet another unprecedented move by a major record label, both songs were sung purely in French. It was a scenario that Vin's cousin, swamp pop singer Joe Barry, memorably referred to as "a miracle." Yet Bruce hasn't always been accorded the respect he deserves among the Cajun music cognoscenti. The problem, explains his cousin and lifelong band mate Leroy Martin, is one of geography. Despite generalizations to the contrary, most Cajun music sprung from the prairie country that stretches from Lafayette to Lake Charles, rather than the lesser populated marshlands and bayous to the south. When Iry LeJeune's regional hit Love Bridge Waltz was released by Houston's Opera Records in 1948, its popularity reversed the disappearance of the accordion that had begun in the thirties. LeJeune's further recordings for the Folk Star, T'N'T and Gold Band labels swelled the popularity of the instrument, paving the way for Lawrence Walker, Nathan Abshire, Aldus Roger, Sidney Brown and other accordion-wielding bandleaders who would eventually (and deservedly) be afforded legendary status. But while the accordion was back in favor with a vengeance, it never really took hold east of the Atchafalaya River. Therefore, Bayou Lafourche's style of Cajun music -- as much hillbilly as it was Acadian –- very rarely used an accordion. "Vin was totally, totally ignored because he was never considered a Cajun singer," says Martin. "Being from the South East, he was considered a country artist as far as the Lafayette area was concerned. But down here he was the hottest thing they had; they played his Cajun songs on the radio stations in New Orleans and 'Dans la Louisianne' became a sensation -- I'm talking about '52 now -- he used to do personal appearances and they had to take the money in buckets." Ervin Joseph Bruce was born in Cut Off, Louisiana on April 25, 1932. His father, Levy Bruce, was a fiddler who often entertained at Cajun house dances in the area. "I only went to the seventh grade and we were so poor," Vin remembers. "When my brother went to the service that was my first time in New Orleans; to see him leave. Before that I never passed Raceland. We would go trapping for four months at a time and live off the land. They had a boat that would bring us groceries about every ten days. We would just stay in the marsh. My dad was a great fiddle player. I wish I'd have had a tape recorder to tape him. When we used to go trapping back in the marsh I'd bring my guitar and he'd bring his fiddle. That was our radio; that was our music." Vin didn't so much learn specific songs from his father as he did styles, patterns, rhythms and the overall feel of early Cajun music. "He used to play the waltzes and the two-steps and the codrilles and I'd follow him with the guitar. And I learned a lot by just watching him. My mama bought me a guitar when I was seven years old. She paid ten dollars for it, second-hand. It was a Dobro-style guitar; it was kind of hard to play." Undeterred, Bruce pressed on. And even though he was a shy country boy, he also began to sing. "Hillbilly music was all we listened to," he recalls. "We started on Jimmie Rodgers, my grandmother was a Jimmie Rodgers number one fan. She had a record player with one of those crystal heads you called it. You'd put a needle in there, a sharp needle. She had to crack it, change the needle, then they had that brush. You'd brush it before playing it so that needle wouldn't get too dirty. And she did it herself. Maybe twice a month we could go sit down around that old record player and play those Jimmie Rodgers songs. We had a battery radio at that time; one wire from one roof to the other. Ernest Tubb came out with some old stuff before 'Walking The Floor Over You' and we'd listen to that. We had some other singers. But that's the way I learned and I heard. I said, 'I wish someday I'd be one of them." Of course, very soon, he would be. But not before he met Tubb in person in New Orleans. "Johnny Schouest had brought me," Vin remembers, referring to his future manager. "Johnny knew his way around and Tubb came to the Municipal Auditorium. So we went back stage -- Johnny knew the big man to get in back stage -- and Tubb was on a break. But Tubb was so much of a nice guy. So Johnny said, 'This is the boy that wants to meet you, he's been dreaming every night of you…' and this and that; a lot of bull, you know? Tubb said, 'Where you from, kid?' He had a voice. He got up; I think that man was ten feet tall. By looking at him I was so scared and I said, 'You know what? I want to sing like you.' Boy, that man stooped down and he let it out. He said, 'Son, let me tell you. You want to sing?' I said, 'I'd like to.' He says, 'There's only one Ernest Tubb. When I see you again you're going to be the one and only Vin Bruce. You don't sing like Tubb; you sing like Vin Bruce.' And he was so right. 'Cause anyone who wants to sing like the other guy never makes it. You can't imitate; there's only one of anybody and you maybe can come close to take his place but you'll never do it." Bonvillian would join Bruce's first band, something the aspiring young musician could hardly have imagined as he listened to the influential steel player crackling through the AM airwaves in the late 1940s. "I used to hear Johnny and say, 'Boy, I'd like to play with that man one day.' In those days we didn't hear too many steel guitar players and Johnny was one of the top. He had a hillbilly band, it wasn't no country band in those days, you know?" 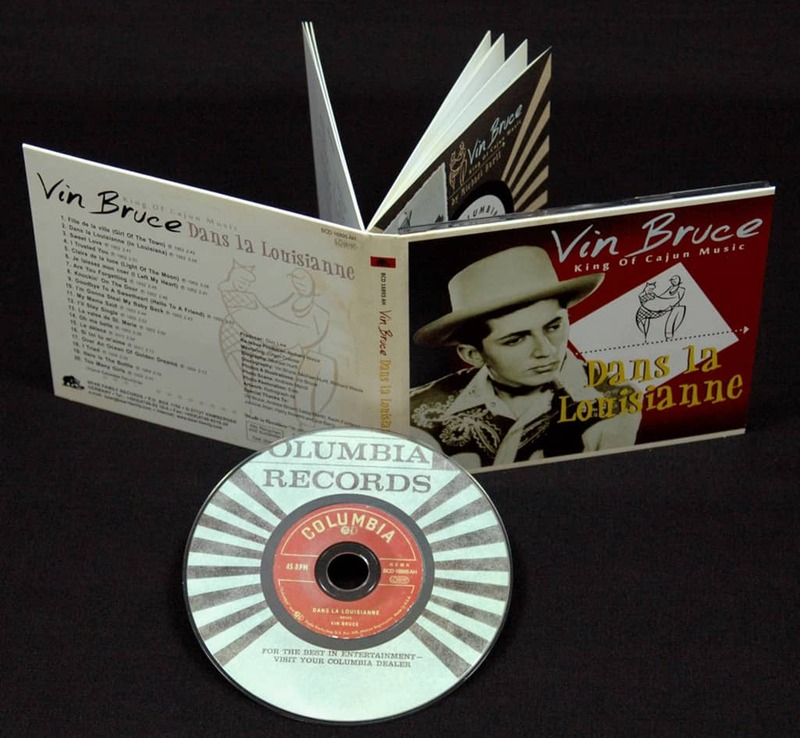 Customer evaluation for "Dans la Louisianne"
I'm glad Bear Family has compiled all Vin Bruce Columbia Recordings, and put this out! An enclosed 34 page booklet includes illuminating, interview-based liners by Michael Hurrt and a boatload of heretofore unseen phots. GET IT!..